Today concludes the Easter season, the 50 days from Jesus’ Resurrection to Pentecost. 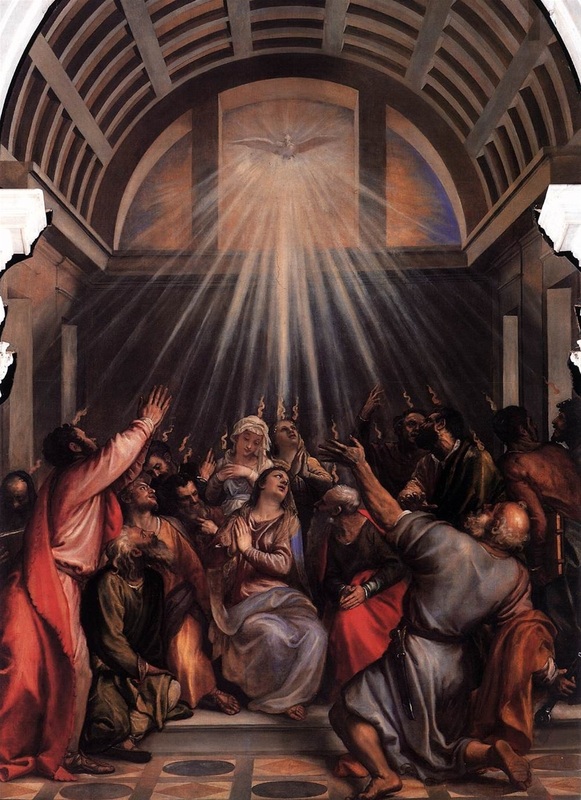 As Jesus has now ascended into heaven the Holy Spirit makes the Lord interiorly present through faith and by the power of the Holy Spirit. In this sense the Spirit gives witness to Jesus. The Spirit is also described as advocate, paraclete, comforter, counselor etc. This means the Spirit is the ‘one called to our side’ or rather (the divine Person Who) indwells us. During his ministry, Jesus had guided, guarded, and taught his disciples. Now the indwelling Spirit of God takes the master’s place. In the absence of Jesus, the Advocate guides the disciples in a profoundly intimate and personal way to the fulness of the truth, reminding them of what Jesus had taught. In this way Christians become Christ present in the world, producing the fruit of the Spirit in their lives. And in this way the Spirit conforms us to Christ. With God’s love poured into our hearts making Christ interiorly present, we are empowered and emboldened to be Jesus’ presence in the world. This precisely why the gift of the Holy Spirit can renew the face of the earth, if every Christian were intent on inner renewal. St Paul tells us very clearly if we are, or are not, allowing God to renew us and to conform us to Christ. If you are guided by the Spirit you will be in no danger of yielding to self-indulgence, the Spirit is totally against such a thing. The opposite, pleasure-seeking, produces a spirit opposed to God’s kingdom and occurs when we fail to carry out our good intentions. This common experience of failure and sin calls for perseverance. We have the gifts of the Holy Spirit and the nourishment of the Body and Blood of Christ, but we also have the freedom to choose a selfless or a self-indulgent life. When self-indulgence is at work the results are obvious: sexual vice, impurity, and sensuality, the worship of false gods and sorcery; antagonisms and rivalry, jealousy, bad temper and quarrels, disagreements, factions and malice, drunkenness, and all such things. On the other hand, all who belong to Christ have crucified self with all its passions and desires: the fruit of which Spirit is love, joy, peace, patience, kindness, goodness, trustfulness, gentleness and self-control. Bottom line, for our behaviour to be guided by the Spirit we must not give way to a life of self-indulgence, rather we must make it our intention to crucify self. This alone produces inner renewal and the fruits of the Spirit. Tough-gig, but worth it.